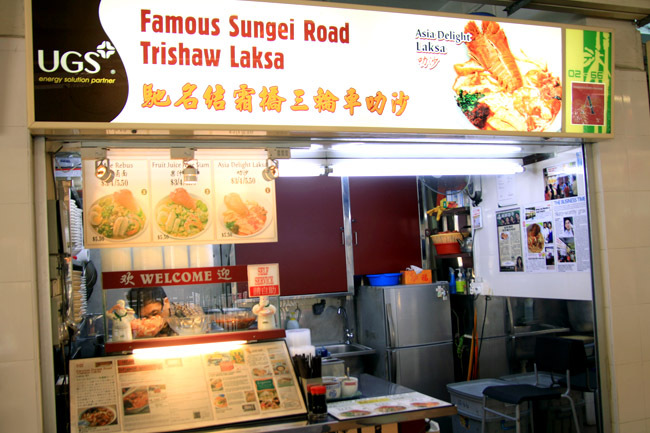 After a very long search, this is my discovery – a stall at Hong Lim Market called the “Famous Sungei Road Trishaw Laksa”, though its laksa is hardly as famous as Katong’s. 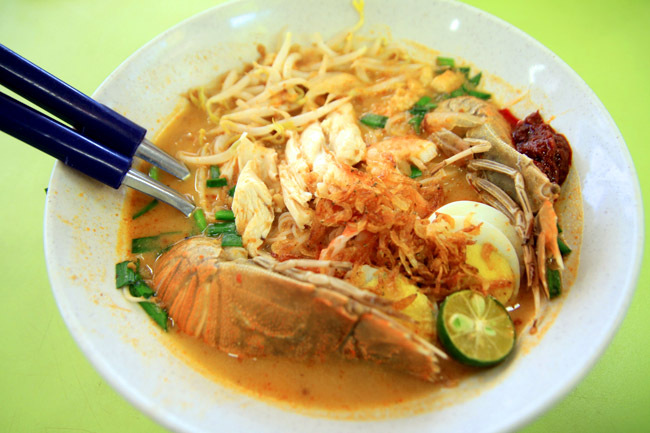 However, their signature dish is most likely the only one in Singapore, found at no other place… Presenting… The Fruit Juice Crayfish Mee Siam ($6). Huh? When I texted my friend I wanted to try Hong Lim’s famous Fruit Juice Crayfish Mee Siam, she thought I left out the “and” and meant fruit juice and clayfish and mee siam. No, no, no. This dish is everything in one. Mee Siam is a dish of thin vermicelli cooked in a light, spicy, sweet and sour gravy, though the Chinese and Malays in Singapore cook it slightly differently. Ingredients are simple and similar, such as hard boiled egg, bean sprouts and dried bean curd. But NOBODY calls it fruit juice mee siam, or adds a crayfish on top. 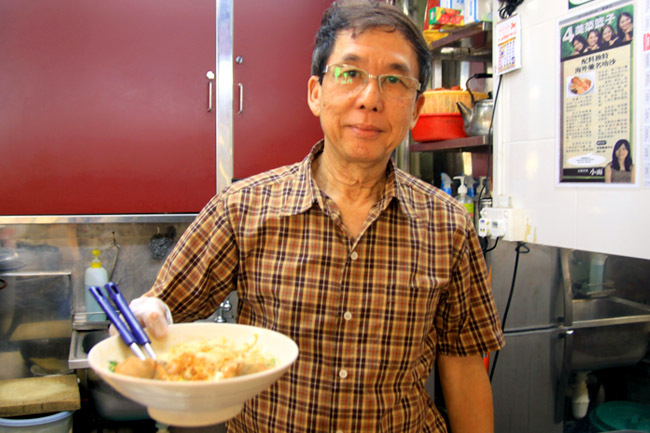 Owner Daniel Soo is one of the friendliest hawker I ever met, mild-mannered with all smiles. He explained in fluent English that his food is “healthy, all-natural, good quality, and found no where else in Singapore.” I believe him. He uses only fresh products and ingredients because health for customers is his number one priority. 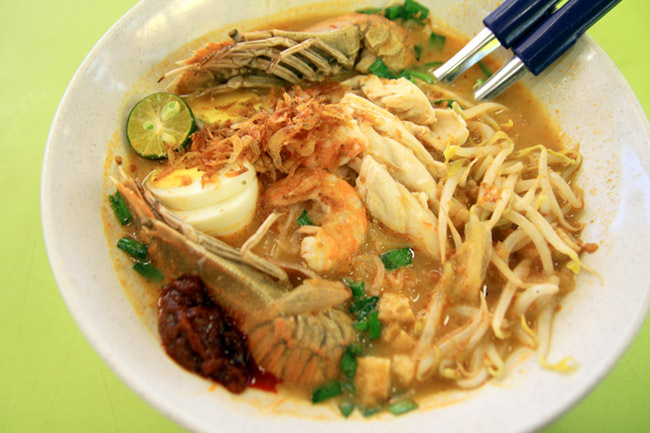 The mee siam is more tangy, sour and slightly citrusy, very unlike any other mee siam you ever tried. There is no assam added, only some “secret ingredients” which the owner refused to reveal. I guess there is pineapple juice added. Tell me what you think. 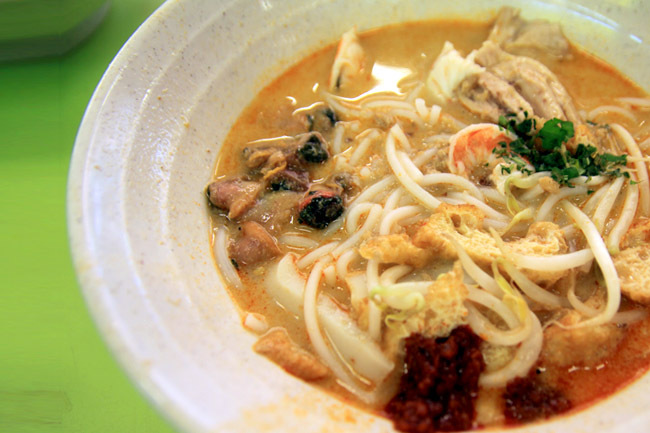 The Asia Delight Laksa ($3/$4/$5.50 with crayfish) is also one of a kind. The gravy cooked using fresh coconut, scallops, dried oysters and dried prawns is rather sumptuous and flavourful, yet very very thin with texture like some chicken soup. It is not as ‘lemak’ (coconuty) or thick like the normal (unhealthier) ones, but taste is not compromised. Mr Soo is also generous with the ingredients with fishcake, prawns, cockles, tau pok and slices of chicken added. Where to find? Delicious? Yes. #UniqueHawker? Definitely. Mission accomplished.